Very recently the fourth annual harmonium conference or "Harmonium Habba", held under the auspices of the Bijapure Harmonium foundation (chaired by Dr. Ravindra Katoti) concluded successfully in Bangalore. Reading about this conference as well as hearing first hand accounts from my guruji Pt. Tulshidas Borkar and my dear friend Dr. Ravindra Katoti brought to me a sense of peaceful satisfaction and happiness, a sentiment of warmth and contentment about the success of this even. I personally know a lot of artists who performed there this year. My guruji's performance was the concluding event - the most respected slot in the conference. An instrumental ensemble consisting of the harmonium, guitar and sarangi as well as harmonium-flute duet were some of the successful recitals during this conference. All these were certainly some of the reasons for my happiness, but surely, these were not just it! Why, the artists who performed here perform often at other places as well - and those concerts are successful as well. My guruji performed the concluding event, but then I have heard him perform in person in small and large concerts many times before and experienced his soulful and emotive music at much closer quarters. Besides, this event was staged a couple of oceans away from me, and I had no direct or indirect involvement in it. So why then, did I experience this odd and inexplicable feeling of unnecessary happiness? As I pondered this question today, the answer came to me. This conference is a tribute to the lifetime achievements of the nonagenarian Pt. Rambhau Bijapure of Belgaum, a quintessential artist, venerable guru and while we are blissfully trading cliches, a gem of a personl with a heart of gold. The conference is a strong representation of the deep guru-bhakti of Dr. Ravindra Katoti and his team and of the Guru-Shishya paramparaa which is the cornerstone of our music. And that is what gives me greater happiness than the success of that event. The fact that the legacy of this great guru is being carried forth through this conference; that he witnesses it today with his own eyes with what probably is a sense of satisfaction and quiet accomplishment; that he will not be relegated to join the ranks of those who are forgotten or "discovered" only after they are no more. I have had the privilege of meeting Pt. 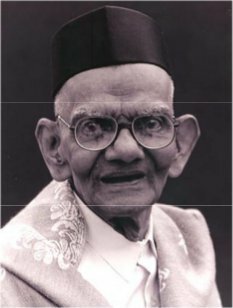 Bijapureji - or Rambhau as I tend to think of him, several times over the last 10-15 years. Rambhau is from the pleasant town of Belgaum, which sits at the border of Maharashtra and Karnataka, and benefits from the great musical traditions of both Dharwad, which lies just over an hour to its south and Kolhapur, just over an hour to its north. As luck would have it, I married a lass from this balmy burg of Belgaum and fortuitously, her father, a college professor in economics, turned out to have been a student of Rambhau on and off over the last several decades. The first time I met Rambhau was in 1997, a couple of years after my marriage, when I had gone to visit my in-laws in Belgaum. I had heard of Rambhau from my guruji. I had also heard his student Dr. Sudhanshu Kulkarni accompanying accompanying Mrs. Veena Sahasrabuddhe when she had toured the US in the 90s. So I was naturally curious to meet him. My father-in-law took me to his house; he greeted us in the ground floor living room of his modest bungalow. Rambhau has an imposing, and somewhat daunting personality and I was rather intimidated when I first saw him. He casts quite the majestic impression at first sight! He is a very tall man with angular and conspicuous long features. He has protruding ears that almost look like that of Lord Ganesh and surprisingly long fingers that cause you to think, no wonder this man is an artist. He has crystal clear and authoritative diction. His bold and bulging eyes convey that this is no ordinary man and the spark within them betrays his brilliance. His expressive face carries the clear signs of wisdom - wisdom arising from decades of artistic and life experience. There is a belief that people with extraordinary brilliance, artistry and talent often have an extraordinary appearance - he is certainly a living example fo such a phenomenon. Shortly after we met him on the ground floor of his house, he asked us to accompany him upstairs to the second level. We walked up the stairs on the outside of the house and crossed a small terrace, into a smallish room with an even smaller foyer. This is the space where he teaches his students. I assumed that the reason he wanted us to go upstairs, was that it was quieter there, his great grandchild was playing downstairs. So imagine my surprise, when after just a few minutes of small talk, he took his harmonium out, and asked me to play for him. Rambhau was born in 1917, so at that time he was 80 years old. I, on the other hand, was just in my mid twenties. He had been teaching and performing since 1938, for almost 60 years. I had barely started my musical career. To say that I was a mere pup compared to him would be a pathetic understatement. Further, in all my experience prior to that day or for that matter after that day, whenever I went to visit other senior artist and pay my respects, the visits were only social and I do not recall anyone asking me to play for them - especially so in the very first visit. It should be no surprise then, that his unexpected command for me to play for him caused me a sudden feeling of dread in the pit of my stomach. On the one hand, I was exhilarated that he actually wanted to hear me play, and on the other, I was a nervous wreck. However, this down to earth manner, encouraging tone and inviting smile helped sooth my frayed nerves a little. I took a deep breath and started tuning the tanpura. That day, I played a short Raag Madhuvanti - probably for 15 minutes or so. He complimented me on my taalim (education) and taiyyari (command) and encouraged me to continue learning and growing as an artist. Emboldened by his encouragement and friendliness, I summoned up courage and moved the harmonium toward him, requesting him to play a little something. I was half expecting that he would be offended at my brash request, or make some excuse, ask for forgiveness given his age, lack of physical strength etc. To my great surprise and thrill, he was very couteous and despite being tired and a little short of breath, he acquiesced and played for me a short piece for about ten minutes. I was ecstatic! I didn't know what to be more overjoyed about - the fact that this great artist had heard me play for 15 minutes, or that he had himself played exclusively for me!! What is weird though, is that today, I do not remember what Raag or bandish he played at that time. What I do remember, is how magical his touch on the harmonium was, how clear it was to me in the very first phrases he played, that I was in the presence of a man blessed with a unique artistic spark and how he transported me within minutes, to the very heart of the Raag he was playing. Even today, I can close my eyes and go back to that moment and relive it. It was akin to being led by the Pied Piper into the magical kingdom. I do not remember the tune he played, but can re-experience at will, the magnetic pull of his music. After I got back home, I immediately called my guruji and recounted the enchanting experience I had just had. My guruji corroborated my impressions - of the spark and magic of Rambhau's soft touch on the harmonium. Rambhau is one of those rare harmonium players of his generation, who took the effort to truly learn Raag-Daari. His first Guru was Vidwan Hannikeri Mallyya. He took further training in harmonium from Pt. 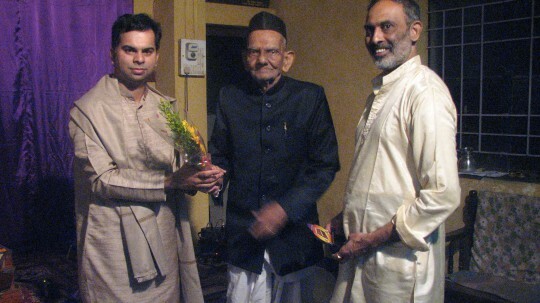 Rajwade, Shri Govindrao Gaikwad and Pt. Hanmantrao Walwekar. He also learned vocal music from stalwarts like Pt. Ramkrishnabua Vaze, Pt. Shivrambua Vaze, Pt. Kagalkarbua, and Pt. Utturkarbua. In some ways, his five-minute recital of the Raag that he played for me, reminded me of the three-minute HMV recordings of Pt. Ramkrishnabua Vaze. One of the hallmarks of these recordings is that Vazebua instantaneously creates the ambience and atmosphere of a Raag. He immediately drowns you in the essnece of the Raag. There is no duality between Vazebua and the Raag. It's almost as though the Raag Himself is conversing with you. The medium of Vazebua ceases to exist. In a similar manner, Rambhau's style of introducing a Raag is so full of drama and so poignant that it cannot fail to grip you. Lesser artists worship the Raag, beckon it, plead with it, caress it, slowly try to woo it and eventually, if the Raag is pleased with their worship, He may join them in a mystical duet! But not Rambhau... he is among the few who command the Raags they play, can invoke their spirit and have them spring joyously into full bloom at a moment's notice. The artists that Rambhau has accompanied over the entire course of the 20th century constitute a veritable who's who of Hindustani Classical Music - Pt. Ramkrishnabua Vaze, Pt. Mallikarjun Mansoor, Pt. Kumar Gandharva, Pt. Bhimsen Joshi, Smt. Gangubai Hangal, Pt. Basavraj Rajguru, Smt. Manik Verma, Smt. Kishori Amonkar, Smt. Malini Rajurkar, Dr. Prabha Atre and many others. In spite of his amazing artistry, Rambhau chose to spend most of his career rooted in the small town of Belgaum and dedicated himself to a life of teaching. Today, if there is one thing that might give him an occassional pang of regret, it is probably the implications of his chosen path on his place in the limelight. Other than to the musicians of yesteryears, he remained a little known artist from a small town, and did not enjoy the national fame that other high profile harmonium players did. Subsequent to our first meeting in 1997, I have had the privilege of seeing Rambhau multiple times during the last 13 years. Every time we met, I have played for him and every time he has been very encouraging and has given me his blessings. Pt. Rambhau Bijapure blessing Kedar Naphade, also in picture - Dr. Sudhanshu Kulkarni. Aug 2009, Belgaum, Karnataka, India. My latest visit to Belgaum in August 2009 though, was especially memorable. I had the chance to spend 3-4 days with Rambhau. My guruji was in Belgaum on the first day and he and I visited Rambhau together. Seeing these two great artists interact informally with each other, away from the public eye, was a treat. There were no false pretenses or airs, no dramatic exaggerations or mutual sycophancy. The conversation was filled with genuine mutual respect, and being a fly on the wall was a treat. As they say, गुनी गुनी जाने - It takes one great man to recognize another. In this same trip, I also had the privilege of meeting his students Dr. Ravindra Katoti, Dr. Sudhanshu Kulkarni, his son Saarang Kulkarni and the vocalist Shri Shreedhar Kulkarni. I heard all of them perform and immensely enjoyed each and every performance. I got to know all of them on a personal level and was touched by their warmth and their true devotion fo their guru. This man has created a great tradition, sincere students who are respected performers and are continuing to further teach and create more artists. A few days later, Pt. Bijapure, Dr. Katoti, Shri Shreedhar Kulkarni, and Shri Narayan Ganachari (tabla artist) all visited us at my in-law's house. Dr. Katoti traveled all the way from Bangalore to join this informal get together. We had planned to perform for each other, enjoy the valuable "लेन देन" - give and take or exchange of musical knowledge that invariably happens when open minded artists get together. Dr. Katoti played a touching Puriya Kalyan that day followed by Shri Shreedhar Kulkarni who sang Maru-Bihag. He sang in the typical Gwalior gharana style, in Madhya-laya Tilwada, ably supported by Shri Narayan Ganachari on table. In his recital, he demonstrated excellent command over the Raag, the taal and showcased some very speical elements of Gwalior gayaki. Up until that point, I did not know who he had learnt from, so I asked him. He said he had learnt from Bijapureji until he was 30 years of age and only after that had he sought guidance from Pt. Yashwantbua Joshi. This was quite a revelation to me! Many instrumentalists learn from vocalists, with vocal music being the foundation of most instrumental performances. However, I had not come across an artist of the level of accomplishment of Shri Shreedhar Kulkarni, who had received all his basic training from an instrumentalist. This showcased to me a hitherto unknown unique dimension of Pt. Bijapure's career as a teacher and musician. Just after Shreedharji's recital, we were hit by Murphy's law; "Anything that can go wrong, will go wrong"! The benevolent Belgaum municipal corporation had decided that there was no better time for a electric power shutdown in our neighborhood, than when Pt. Bijapure was just about to start his harmonium solo recital. I was really distressed - how could we conclude the mehfil that day without it being blessed by at least a few minutes of Rambhau's harmonium? So we brought out the spare flash lights, converted a table into a light stand and in spite of the lack of electricity, lovingly requested, nay insisted that Rambhau play for us. At that time he was 92 years old. It was the end of a long day. It was annoying that there was no power. Dinner was ready and served. His great grandchild who was also there was getting restless. There were a dozen reasons for which he could have politely declined and asked to call it a day, rather than play in the dark, battling mosquito bites. But as they say, those that are steeped in knowledge are also steeped in humility. In that near darkness, he performed for us a few minutes of Bhairvai in his inimitable dramatic style - luring us, taking us into the Raag and trapping us in its enchanting environs, as only he can. I will forever remember the sense of awe, enchantment and sheer respect I felt for this great man that day and cherish the precious moments I was able to spend with him. I wish him continued health and happiness in this last phase of his life and congratulate his able students for continuing to carry his legacy forward. Such articles are written often about great artists when listeners and music lovers like me are overwhelmed and driven to express their emotions through the power of their pens. However words fall woefully short of being able to convey the full import of the experience and the sentiment to the readers. As I re-read this article, I am struck with the same impression - but in this case, I am lucky. I do not have to depend purely on my words. In spite of the lack of electric power and bright light in the room, I have a crude video recording of Pt. Bijapure ji's performance from that mystical night. There was hardly any light to speak of. I was recording this with a photo camera, not a professional video camera. I am hardly a professional videographer. The video is grainy. The sound is not exactly pristine as there were no microphones and the sound was also captured through the same photo camera that doubled as a camcorder. There is the occassional external sound in the video that is unavoidable when you are in a house that's on a moderately busy thoroughfare, rather than being a soundproof studio. However in spite of all these flaws in the video, I have watched it over and over for the last year or so and every time it has brought a smile of wonder to my lips.